The System IV complex is directly north of the Sunken Patio and the stairs in the centre of this photo are the stairs leading southward out of the Sunken Patio. The columns at the top of the stairs would have supported a roof, presumably to create a ceremonial gateway as there is a staircase the far side of the columns, probably about twice the height of this side, which lead down to the Gran Plaza. System IV was built late in Monte Alban’s history, in about 400-500 C.E., which would explain why it is a little squashed in. 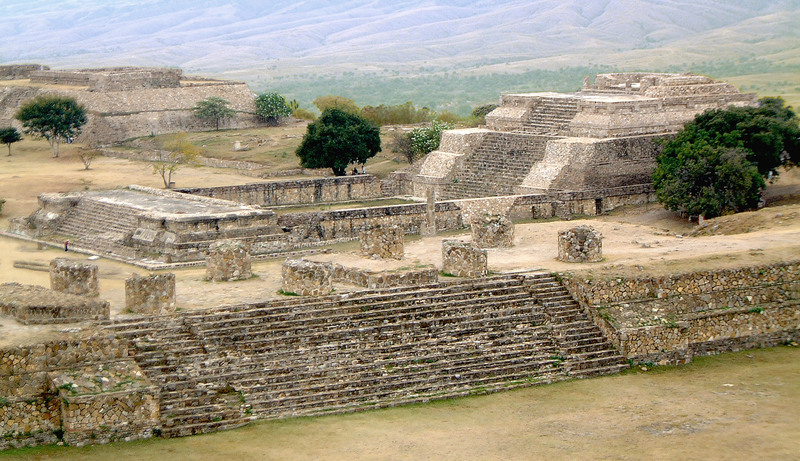 Development on the temple continued until the collapse of Monte Alban as an economic centre in the 8th or 9th Century, which resulted in the high walls and almost secretive inner sanctum. System IV makes distinctive use of the talud-tablero architectural style which gives it striking juxtaposition from the other temples around the site. System IV is also offset from the strict north/south axis as though designed to face something else – presumably the exact point the sun rose on the horizon. System IV is almost identical to System M in its patio-temple styling, size and alignment.